Machine Learning (ML) is a subset of Artificial Intelligence (AI). In this subset, algorithms scan available data and learn the relations between blocks of information. This learning phase results in the creation of a computing model. Typically a model is iteratively improved by scanning a new set of data, with little or no human intervention. Just like humans, these algorithms are learning by observing complex data and iteratively adapting themselves according to the feedback in their observations. At Trifork, we have been using Machine Learning as a way for our clients to achieve rapid growth through smart solutions. In essence, through us these clients are leveraging the fact that machines are far better and faster at training models to identify patterns in data at large scale than a person. Through these models, business owners benefit from more actionable insights, lower costs, higher turnovers, far greater convenience and efficiency. In short, many of our clients now use their archived data to overtake their competitors by providing better services and products at a lower cost. These clients realize that the time to act is now. Start adopting ML in your business. We are here to lead the way. Machine Learning team at Trifork consists of design thinking experts, data scientists and software engineers. These professionals can help your organisation in a wide range of situations, to unlock the Machine Learning’s full potential. Design thinking experts clarify business challenges and come up with novel solutions. These solutions will be translated into the computational models by data scientists and Machine Learning experts. Software engineers integrate the real functionality and the result of the computational models into the core of your business. They make sure that the end user can smoothly use and benefits from the solution. We regularly organise meet-ups and accelerator workshops to guide your business swiftly from awareness through solutions to scalable systems. Of course, we’re always available to assist and coach you through the process of implementing ML within your organisation. We’re here to lead the way. The ultimate goal of any project is that it has a positive impact on business. 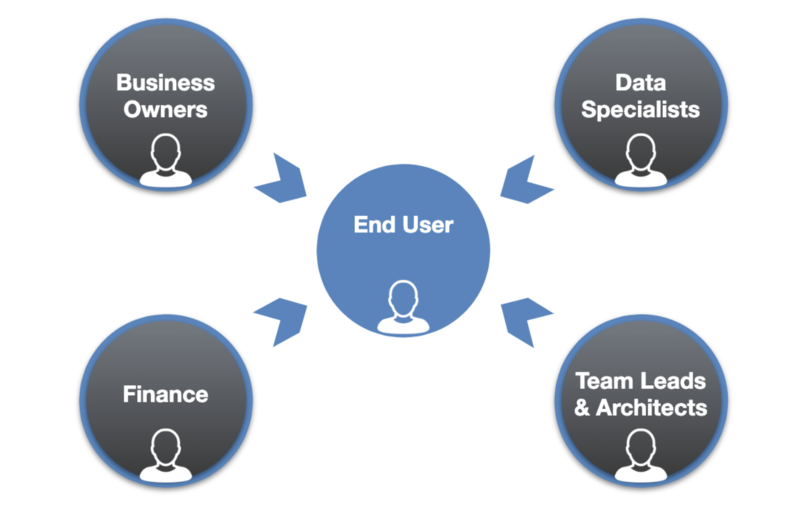 Moreover, the biggest reason for project failure is a lack of user adoption. It is important to ensure that the users embrace the newly developed solution and adopt its new way of working. That is why, at Trifork Machine Learning, we believe in five main stakeholders for successful delivery. By integrating these groups we believe that the solution will be both useful and used. 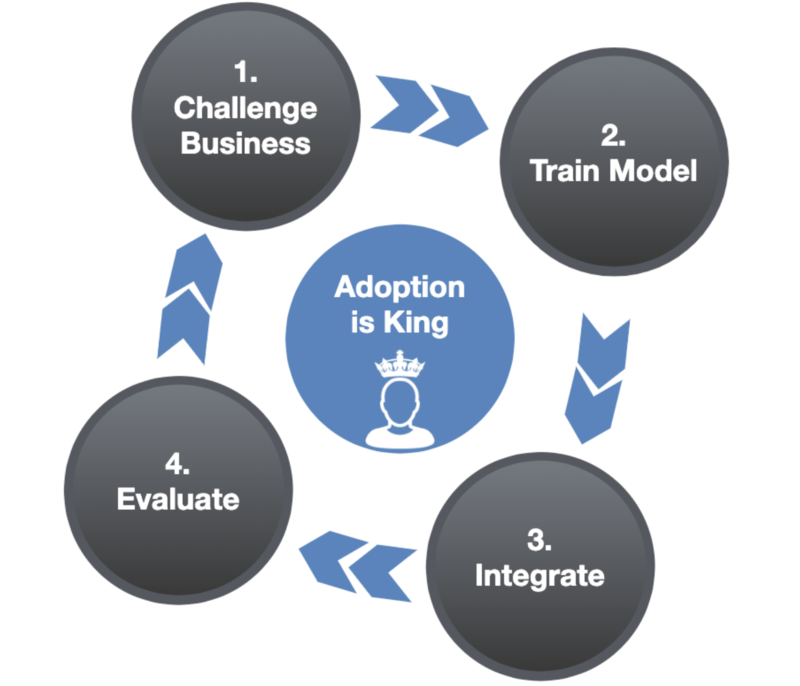 Adoption is king. The first step in Agile Machine Learning is clarifying the business challenges your organization faces together with all five stakeholders. After understanding your business challenge, our engineers use the relevant data to build a model that best serves the solution. The model will be integrated into the existing software landscape and processes. The software integration will be done according to the existing software guidelines within your organisation to ensure the compatibility between different systems. When the solution is in use, the gathered feedback serves us in two ways. First, we can use the feedback to optimize the model. Secondly, the feedback collected through traditional KPI dashboards shows the value of the solution and serves as input as to what should be focused on next. By using Agile Machine Learning we ensure that we rapidly deliver tangible results with a measurable competitive advantage to your business. The first step taken with Artificial Intelligence is the most important one. This workshop gives you a good idea of the potential of (your) data and you will already get value from your first workshop. Develop models with Machine Learning based on the data from the Axon event store for Understanding, Predicting and Reacting. With Artificial Intelligence your customer contact can be optimised with functionalities for quick onboarding, first time right decisions, quick handling of call and employee and customer satisfaction. A personalised recommendation system provides the most relevant information to a user by discovering similarities and patterns in the data. CoreML allows you to use the iPhone’s built-in dedicated AI chip out of the box, and run Deep Learning models on your device. Smart Document analysis tools allow you to intelligently scan and digitize your documents, extract information and detect forgeries. … a service centre to customise and optimise its decision-making processes, increasing its customer satisfaction levels? … a service company to predict machinery maintenance requirements, improving its bottom line? … a manufacturing facility to check its production process and finished product quality levels, slashing its reject rate? … a law firm to extract information from its contracts and identify changes, reducing the need for human input? … a call centre to implement a virtual assistant to help its new staff make better decisions? … a healthcare provider to evaluate and recommend courses of medical treatment based on past cases, improving its patients’ quality of life? If you want to know more about our Agile Machine Learning way of working at Trifork, fill out the contact form.